JUNE 3--The next time Laura Ingraham decides to taunt a teenager like David Hogg, the Parkland shooting survivor now helping to lead a nationwide gun control campaign, perhaps the Fox News host will recall what she was doing when she was Hogg’s age. Which was getting arrested and convicted for being a thief. 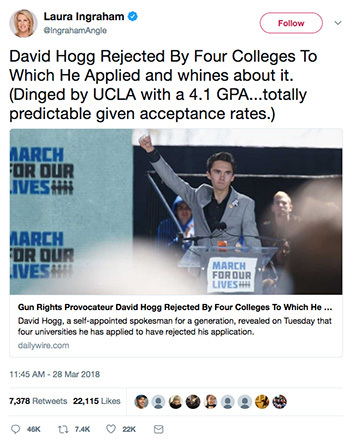 Hogg, who graduated today with his Marjory Stoneman Douglas High School classmates, is a 4.1 GPA student whose activism has made him the target of right wingers who have displayed a creepy obsession with the teenager. In fact, Hogg--along with fellow Parkland students like Cameron Kasky and Emma Gonzalez--have been the subject of oppo research usually reserved for political candidates decades older. So, how would a young Laura Ingraham have fared in the face of such scrutiny? A search of court records in Connecticut, where Ingraham grew up, and New Hampshire, where she attended Dartmouth College, revealed the kind of youthful misstep for which Hogg & Co. would surely be castigated by Ingraham’s viewers and conservative law-and-order types. While Connecticut indices were negative for Ingraham’s name, a New Hampshire court retrieved one responsive record. 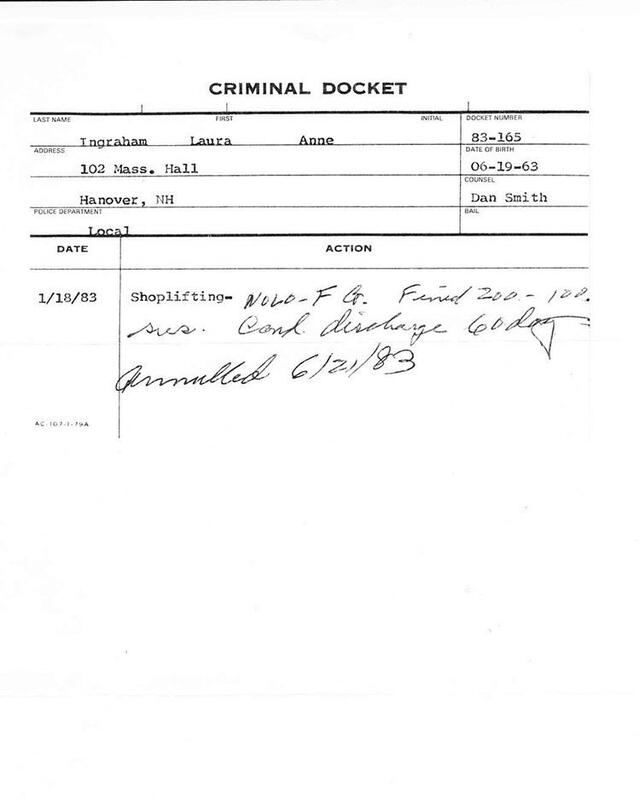 The Circuit Court covering the town of Hanover--home to Dartmouth--found a criminal docket revealing that Ingraham was busted in January 1983 on a shoplifting charge. Ingraham, then a sophomore living in a Dartmouth dorm, was 19 at the time of her arrest by local police. The one-page criminal docket indicates that Ingraham entered a no contest plea (“NOLO,” short for nolo contendere) and was fined $200 and sentenced to a conditional discharge on the misdemeanor conviction. A conditional discharge allows a defendant--if they avoid further trouble--to petition the court to have their case records annulled, or expunged. The handwritten docket also includes a “60 day” notation, but it is unclear to what that refers. Additionally, with no other court or police documents available, it is unknown what Ingraham swiped, the value of the stolen goods, or who the Ivy Leaguer victimized. 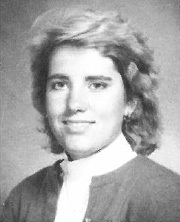 Ingraham, seen at left in her 1985 yearbook portrait, appears to have quickly petitioned to take advantage of the conditional discharge provision covering records expungement. 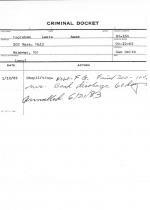 Five months after her collar, Ingraham’s criminal case was annulled, according to an entry on the criminal docket. After mailing TSG a copy of the docket in response to a written request, a court official said that the document was mistakenly released by clerk’s office personnel. A records expungement--often granted to first-time offenders--effectively provides defendants with a clean slate, freeing them from having to disclose criminal entanglements that could possibly hinder future employment and educational opportunities. Upon becoming the Review’s editor, Ingraham distinguished herself through tormenting coverage of Dartmouth’s Gay Students Association (members of the group were referred to as “sodomites” in Ingraham’s copy). At one point, Ingraham even sent an undercover reporter into a meeting of the organization. The Review subsequently published a transcript of the meeting, which was secretly recorded by Ingraham’s staffer. After graduating Dartmouth in 1985, Ingraham worked in the Reagan Administration before getting a degree from the University of Virginia School of Law. She subsequently clerked for Supreme Court Justice Clarence Thomas and worked briefly as an attorney before launching her media career. 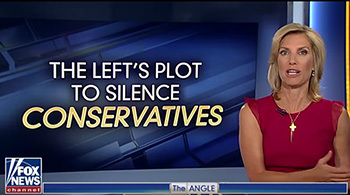 Ingraham’s dogmatic conservatism has been embraced by Fox News Channel viewers and her books are propelled to the top of best seller charts by readers who cannot get enough of her sticking it to the libs. During a speech at the 2016 Republican convention, Ingraham recalled asking her mother in the 1970s why people burned the American flag. Anne Ingraham replied that the parents of the flag burners “didn’t teach them about respect.” In one of her books, Ingraham declared that “permissive parenting” had resulted in “boys and girls” running wild.